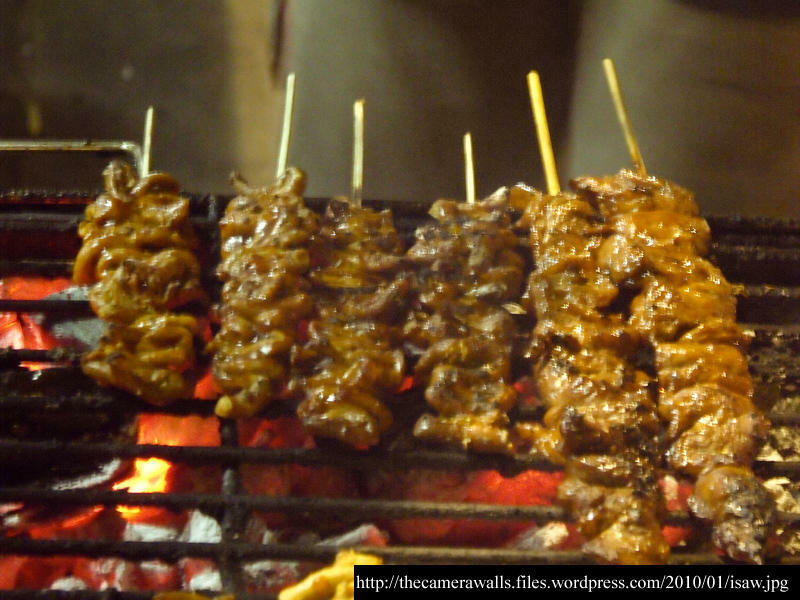 No disrespect to the isaw-lovers from among the readers; but make me eat this, I die! It’s completely psychological. We used to have a poultry farm, and I used to help out. I say, that is putting things lightly. When I was an adolescent kid, I used to refer to myself as my Mom’s poultry boy – naturally with more than just a pinch of sarcasm. I am squeamish about certain foods, but I do eat innards. That is, if I can be convinced that they are the sort that can be cleaned before they are cooked. Take, for example, dinuguan… I know the “halfway-through” is flushed out first from intestines, which are then even soaped and rinsed over again before these are sliced. 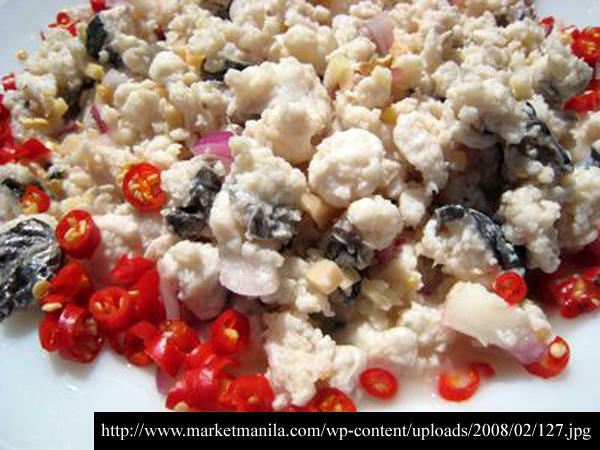 How, pray tell, do you do this with chicken intestines? If you tried to run water through these, they are so thin and fragile that they would break. Hence, you will not have isaw. Or, maybe this is just me… The truth is that I am no authority on this matter for the simple reason that I have never been brazen enough to try it. It is this same psychologically-rooted squeamishness that prevents me from eating adidas. 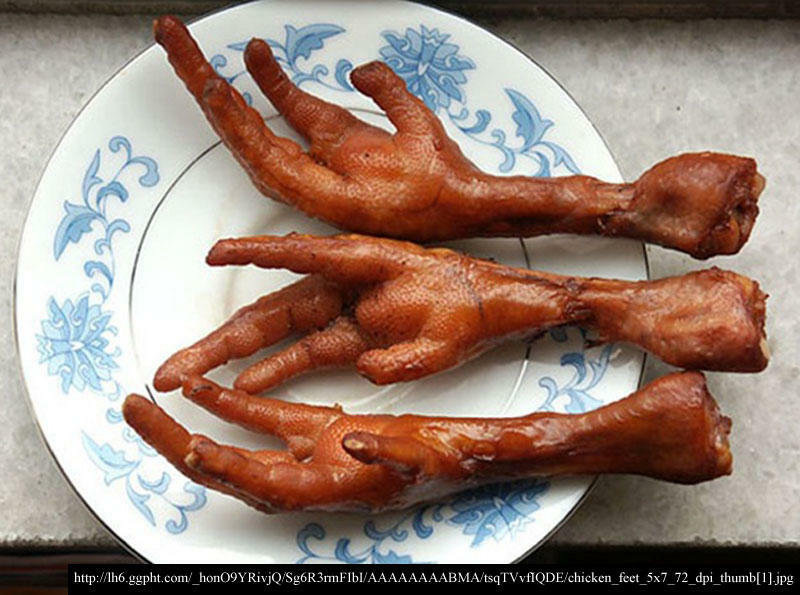 My Mom used to cook these when they were just called chicken feet and long before they became popular street fare. “What was there to eat?” I used to complain to my Mom. As far as I could tell, there were just scales over foot bones; whatever it was in between had to be in the form of cartilage. And what could one get from that…??? The truth of the matter was, in my head, I was seeing the chicken feet stepping on the meshed-wire flooring of the chicken cages in the poultry farm. Often enough, the feet stepped not just on the “halfway-through” but – rather – even on the “all-the-way-through,” which sometimes stuck to the wires on the way down. They’re palakang palayan, my Mom used to coax me. Like I cared… In my head, I was seeing the large ugly garden bull-frog, the sort that held loud concerts on rainy nights and looked slimy from head to toe. As far as I was concerned, a frog was a frog was a frog. End of story! I also do not eat octopus. Now, laugh if you must; but I see in my head those monster octopi that used to hold ships clasped within the grasp of their tentacles in black-and-white movies I used to watch as a little boy. Ironically, I eat squid. Ask my friends, though! I give away the tentacles. There are foods I would like to eat but cannot. This time, the reason is physiological rather than psychological. Feed me raw fish, I die! I am irreversibly allergic! Just this one time I tried kilaw, I ended up in the hospital and was confined for three days! Just a few years back, another former player treated me to snacks at Tokyo-Tokyo. He asked for the California Maki. I took a quick look at the pink meat inside the rice outer wrapping and instantly gave him a suspicious look. “Is that cooked?” I asked. Yes, he reassured me.